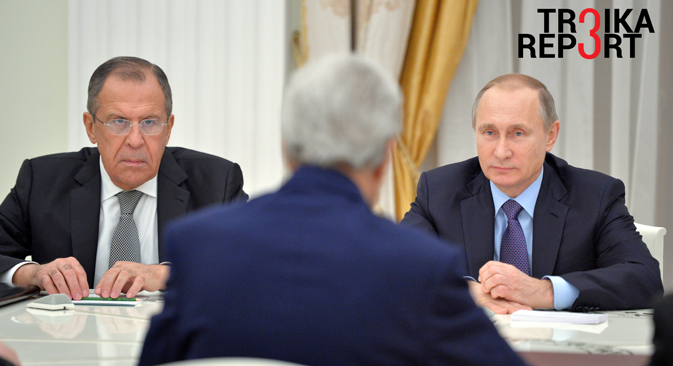 Russian President Vladimir Putin and Foreign Minister Sergei Lavrov during a meeting with US Secretary of State John Kerry in the Kremlin, Dec. 15. U.S. Secretary of State John Kerry’s official visit to Moscow this week for talks with Russian President Vladimir Putin and Foreign Minister Sergei Lavrov caught Russian pundits off guard, with Kerry striking a conciliatory tone and insisting that the U.S. was not seeking to isolate Russia. But can any serious change in Washington’s stance be read into Kerry’s comments? Moreover, Moscow and Washington have found “common ground” on which Syrian opposition groups have the right to participate in peace talks leading to a political transition, Kerry revealed. A meeting of world powers on Syria was also approved, which will take place in New York with the mission to draft a resolution on the essence and format of a political solution for Syria. The resolution would be then presented to the UN Security Council to assume the absolute legal authority. Nevertheless, sceptical pundits in Moscow claim Kerry’s visit has left a bitter feeling of déjà vu, recalling the unmet expectations after the previous upbeat rhetoric in the aftermath of his lightning visit to Sochi in May. Troika Report approached Andrei Kortunov, director general of the Russian Council of International Relations, with the question: Is this once again groundless optimism or is the ice starting to melt, paving the way for a resolution to the conflict in and around Syria? – The contentious issues include the fate of Syrian President Bashar al-Assad and the list of terrorist organizations. U.S. ally Saudi Arabia, which has just announced the formation of a coalition of its own, considers Hezbollah, the Shiite and pro-Iranian organization, among the radicals to be blacklisted. Meanwhile, Hezbollah fighters are engaged on the ground battling with Islamic State (ISIS). This doesn’t leave much hope for a consensus among the “friends of Syria,” does it? – Some 24 hours before Kerry’s visit to Moscow an official pronouncement in Washington focused on the “isolation” of Russia. And then came the unanticipated words: “We don’t seek to isolate Russia as a matter of policy.” What a contrast! A more critical assessment of the motives of Kerry’s conciliatory tone and overtures to Kremlin came from Maxim Suchkov, a visiting fellow at New York University's Jordan Center for the Advanced Study of Russia, who talked to Troika Report. – Yet would it not be fair to assume that the Obama administration would not like to leave plenty of unresolved foreign policy issues behind as its legacy? In any case, this time Kerry left Moscow with a gift from Lavrov (who calls him an “idealist”) – a Russian-style Santa Claus, an amber ring as souvenir he bought from a street stall, and some friendly advice from Putin to find time to have a good sleep to mitigate his travel fatigue. How is the U.S. Secretary of State going to treat these gifts “from Russia with love”? With his positive comments, he has already played the role of Santa Claus for the Kremlin. It sounds good. But does it really matter? The opinion of writers may not necessarily reflect the position of RBTH or its staff.